Yvonne features recipes that are classic favorites from cuisines that are notoriously pork laden. From Cuban to Italian, Yvonne has crafted deliciously halal recipes to satisfy any craving. She also includes recipes for the foundations of dishes that are haram (impermissible) and hard to find substitutes for (think alcohol-based vanilla extract). As you’ll learn in these pages, halal is not just about food: It plays a role in all matters of life and is considered a universal concept from which all of humanity can benefit. Every part of the farm-to-table cycle is significant, and transparency in the food cycle and holistic living are vital matters to Muslims, as a devout follower would never support inhumane treatment of animals or unjust treatment of workers just to purchase a cheaper product. All living creatures are taken into consideration and given their due respect. Compassion is a huge part of any faith, and for that reason, halal food-sourcing and cooking can and should be incorporated into the movement toward sustainability. 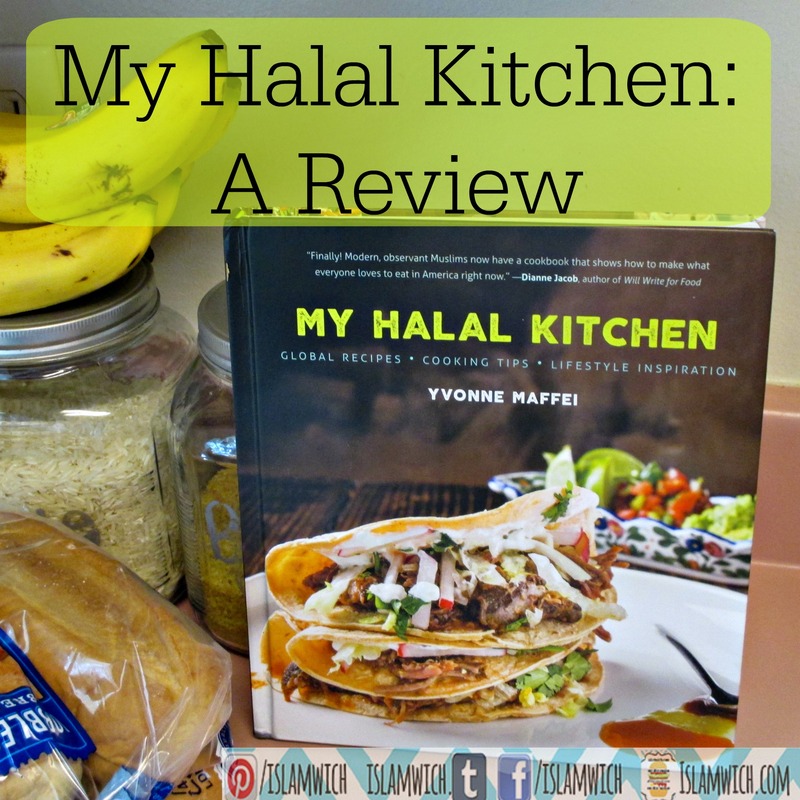 My Halal Kitchen is a book for everyone who wants to be more cognizant about what they eat and want to participate in a more humane food cycle. After my initial infatuation for this book wore off (that’s a normal thing to feel, right? ), I realized that this was the book I have been needing in my kitchen since I became a Muslim. It could have saved me thousands of hours of trial and error in the kitchen, trying to replicate my fav dishes that turned out to have haram ingredients. Then, as if I was going through some strange grieving rejoicing process, I finally realized what I didn’t like about the book … At a full 214 pages, it is too short. I wanted more. I need more. Finally, I accepted the fact that the book was not going to include more amazing info than it did (do I smell a series? ), and I got to cooking. Stop trying to peep this recipe. Get the book! 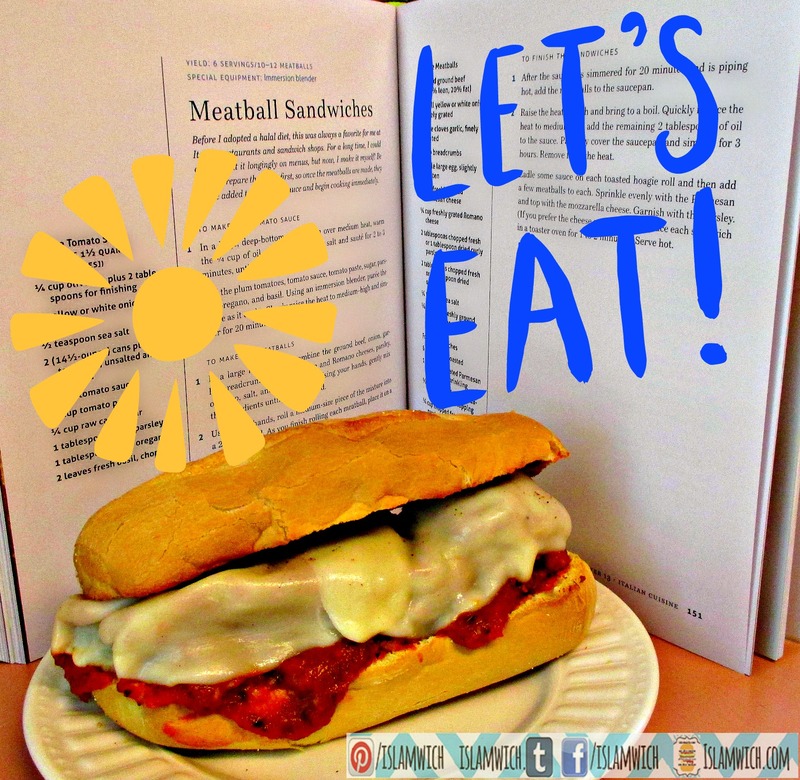 I have always been curious to try a meatball sandwich. I missed the opportunity to try the Italian fare in my non-Muslim youth. Now that I am a Muslim, I find myself drooling over them. But I have never come across one that I trusted to not have pork (a zabihah meatball would be a miracle). 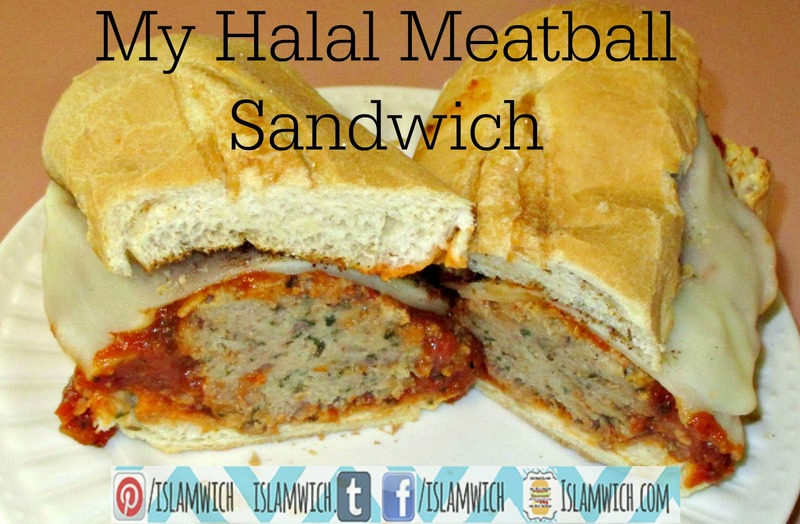 So I decided to try out the My Halal Kitchen version of this saucy, cheesy, meatbally, Italiany fare. And It was AMAZING!!! I am normally not a huge fan of red sauce, but the combo of herbs and a touch of natural sugar in this recipe hit all the right flavor notes ( I heard Padma Lakshmi say that once 😉 ). I can’t wait to try out more recipes. Guys, Gals, Muslims, non-Muslims, alien life forms, what ever you identify as, you NEED this book. It comes in both print and electronic forms, and can be found on Amazon, Google Play, Barnes and Noble, and the myhalalkitchen website. What are you still doing here? Go forth and purchase! Yea, let’s eat! Yummi-li-cuous post indeed and kuddos to Yvonne Maffei for being such an inspirational Muslimah!